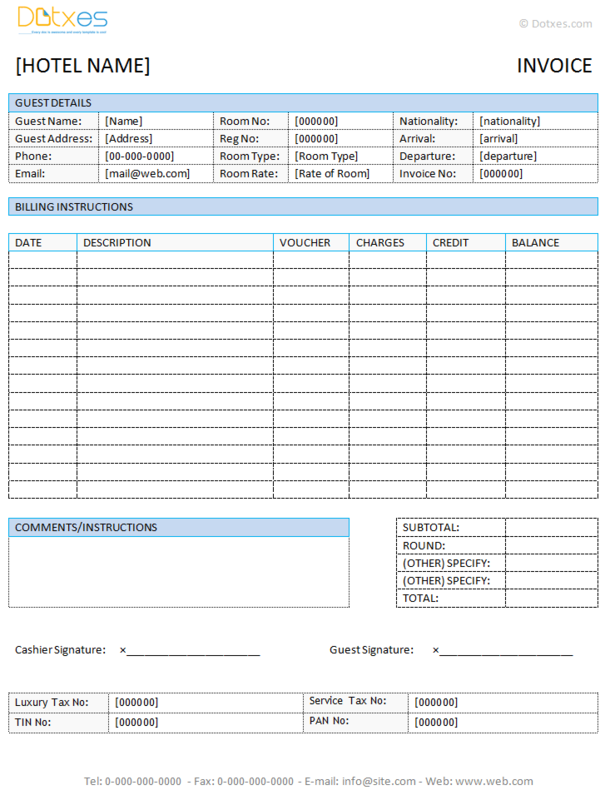 Hotel Invoice Template – Hospitality is one of the most gratifying professions anyone can have. Suffice it to own or manage a quaint Bed & Breakfast, or a hotel for extended stays and you will be hooked. However, tending to all your guests and their needs so expectations are met and surpassed can leave little time for necessary administrative duties. To ease the burden of the hotel owner, Dotxes has developed an easy to use template for Hotel Invoice Template. This hotel invoice template includes all the necessary fields one would need when submitting a hotel bill to a guest. This template includes spots not only for the guest’s information, dates of service and room information, but it also includes the necessary slots for items such as surcharges and services. To add even more flexibility to the template, this template has allowed space for comments and hotel-specific types of charges. An important aspect of any invoice is to create checks and balances between hotel management and the guest, and this hotel invoice template keeps it in mind by already incorporating checks and balances into the template. Hotel owners that choose to use this hotel invoice template will simplify their lives considerably and allow themselves the time to do what they do best – host their guests. For many business owners the administrative aspects of owning their companies can be quite daunting, particularly in the initial stages. It is not entirely uncommon to discover that necessary information is not being captured in certain forms (for example luxury tax collected per room stay) until it is time to report, which can often cause anxiety and duplicate work. By relying on templates you can rest assured that you are working from a template that already includes the important fields and yet can be customized to reflect your business’s own brand and identity. Give yourself the opportunity to concentrate on your business and let Dotxes ® help you set up the back office infrastructure you need to let it run seamlessly. Download the hotel invoice and customize it to your needs and wants, you will not regret it.